Born May 14, 1949 in Hollywood, California, to sculptor Verna Lebow, MFA, and surgeon Paul Kaufman, MD, Alicia grew up in a bi-lingual, intellectual, artistic, musical and politically active household. A passionate follower of her muse since early childhood, Alicia was influenced and acknowledged by three major figures in art, music and literature by her mid-teens. Her multi-instrumental music studies (piano, clarinet, guitar) lead her to learn open-tuned guitar improvisation from John Fahey, then married to Alicia’s cousin Janet Lebow. A summer scholarship to Otis Art Institute enabled Alicia to study with Charles White III in 1965. While working as a graphic layout artist at the infamous Los Angeles Free Press in 1966, Alicia submitted a piece of writing that Joan Didion selected as the quintessential example of alternative press writing for an article titled “Alicia and the Underground Press” in her Points West column in the Saturday Evening Post. In 1966, at age seventeen, after six weeks at San Francisco State College, Alicia began a productive career as a free-lance artist/writer/musician. She sang and played guitar at coffee houses in the Bay Area, wrote songs, drew reams of line drawings, worked occasionally as a cook, and attended a semester at Pacific Fashion Institute in San Francisco. In 1967 she moved to the houseboats off Sausalito where she adopted collage artist Jean Varda as a mentor. At eighteen, she worked out of her own art studio in the Industrial Center Building in Sausalito, where she began creating the 5’x8’ fiber art wall hanging that was featured at the online Hippie Museum during the early 2000s. She sold her handmade clothes and ceramics at the San Rafael Renaissance Pleasure Faire. Easter at Wheeler Ranch, 1970 (photo by Sylvia Clarke Hamilton). The instrument is a Fender electric bass neck on a 12 string guitar. 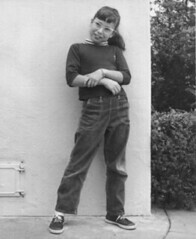 At nineteen, Alicia moved to the Wheeler Ranch Commune in Sonoma County, California and began writing, illustrating and designing Living On The Earth, a handwritten guide to bohemian country living illustrated with line drawings, initially conceived as an informational pamphlet to share with fellow commune dwellers, based on advice gathered from friends at Wheeler Ranch. Published in 1970 by The Bookworks in Berkeley, the book sold out its first edition of 10,000 copies in two weeks, in part due to a rave review in the Whole Earth Catalog. Bennett Cerf, then president and co-founder of Random House, purchased the rights to publish it for Random House. The 1971 Random House Vintage Books edition sold over 350,000 copies, becoming the first paperback book ever on the New York Times Bestseller List. It was favorably reviewed in Time, New York Times Review of Books, Publishers Weekly, Library Journal, Christian Science Monitor, Look, and dozens of other publications, and Alicia was recognized as a Woman of the Year in 1971 by Mademoiselle Magazine. In 1973, Alicia served as one of five judges in the Levi Strauss Denim Art Contest, along with fashion designer Rudi Gernreich, photographer Imogen Cunningham, fiber artist Candace Crockett, and the curator of the De Young Museum in San Francisco. 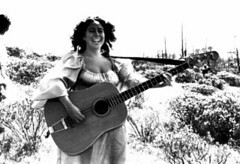 In 1974, Alicia went on a speaking tour in Japan as the guest of her publisher, Soshisha, Ltd. On her way back, she stopped on Maui, and stayed to learn traditional Hawaiian slack key guitar. Over her 30-year residence in Hawaii, Alicia studied Hawaiian music, worked as an underwater photographer, taught yoga, performed extensively as a vocalist/guitarist, had several one-woman art shows, taught art, music, writing and dance at two alternative schools, and illustrated books. 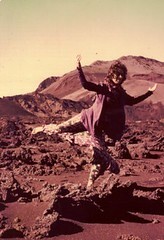 In 1976 she created a public reading of her book, Earth & Aetherias, at the Maui Community Theatre, that included improvised music by the Jungle Lolo Jazz Band and a slide show of book’s illustrations. 1983, she produced a series of illustrated ceramic pictures plates in collaboration with ceramic sculptor Will Herrera. From 1986 to 1988, she worked in a musical duet with folk and Hawaiian music player Wesley Furumoto, for which she created the vocal arrangements. From 1988 to 1999, she produced over 3000 weddings as the owner/operator/founder of A Wedding Made In Paradise – Maui, where she also functioned as event and floral designer and wedding musician. The company was featured on Good Morning America in March 1993, and in half a dozen books on weddings and Hawaii travel during the 1990s. In 2001, following the tour, she produced a second CD, this one of original and historic Hawaiian songs, Living in Hawaii Style, toured it in Hawaii and California, got airplay in both states, and headlined at the Big Island Slack Key Guitar Festival in 2002. Both CDs were released in Japan by EM Records in September 2005. In 2003, Alicia was included as one of thirty representative Northern California authors in Jonah Raskin’s book of essays, Natives, Newcomers, Exiles and Fugitives. She created a color-illustrated inspirational book, How To Make Peace. In May 2006 Alicia released her third CD, What Living’s All About, twelve jazz and blues songs, ten of them original. The CD was an Editor’s Pick in the May 2007 issue of Performing Songwriter Magazine, and received rave reviews from ejazz news (London) and Feminist Review. The opening song, “Floozy Tune,” placed in the Top 20 Finalists in the Jazz Category of the 2007 Unisong International Songwriting Contest, then as 7th place in the International Division of the Indie International Songwriting contest, and then as a Finalist in the 100% Music Songwriting Contest. Radio Free Phoenix featured songs from the CD for five years after its issue. 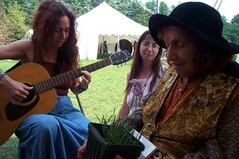 Alicia serenades legendary herbalist Juliette de Bairacli-Levy at the New England Womens Herbal Conference, August, 2000. Living on the Earth was published in its 4th Edition in 2003 by Gibbs Smith, Publisher and remained in print until 2013. Soshisha Ltd. has been publishing the Japanese edition of Living on the Earth continuously since 1972, and it is still in print as of 2019. Soshisha resumed publishing Being of the Sun in 2008. In October 2006, Alicia toured Japan for a month as the guest of Kurkku, an environmental arts organization in Tokyo, performing eight concerts. Fashion designer Aya Noguchi created a line of clothing printed with illustrations from Living on the Earth for her fall 2007 line. Alicia returned to Japan for a fifteen-concert tour from April 26 to June 19, 2007, which included being the subject of a television documentary produced by Setsuko Miura for her ecologically-focussed TV series, Midori No Kotonoha (“Green Word Leaves”), on Asahi Broadcasting Station. In 2008, Alicia returned to Japan for a highly successful gallery show of 30 of the original drawings from Living on the Earth, at Kurkku’s Jingumae Lab in Shibuya,Tokyo, and an eleven concert musical tour, from April 10 to June 2, 2008. Aya Noguchi released a second line of clothing featuring illustrations from Being of the Sun, which were displayed along with Alicia’s art at the gallery. A second, successful show of the Living on the Earth drawings at Mirai Garou, a gallery in the Roponggi Hills complex of Tokyo, ran from August 5 to 31, 2008, and a third show ran during May and June 2009 at the Birdo Flugas Gallery in Sendai, Japan. An architecture book, Spaced Out: Radical Environments of the Psychedelic Sixties by Alastair Gordon, which includes illustrations from Living on the Earth and Being of the Sun, was published by Rizzoli/Random House in 2008. In August 2009 Alicia released her 4th CD, Beyond Living, a collection of Americana/world music songs, which she toured from September 15 to November 5, 2009, in Japan, with a series of eleven live performances plus her fourth gallery show of the Living on the Earth drawings, this time at Gallery Speak For, in the Daikanyama Fashion District of Tokyo. Her fifth gallery show of Living on the Earth drawings was at Cafe Unizon in Ginowan, Okinawa from October 6 to November 3, 2010. Radio Free Phoenix began featuring songs from Beyond Living in January 2010. In 2009, organic fiber, fair trade fashion designer Kaoriko Ago Wada began licensing and printing Alicia’s illustrations on clothing made by her company Little Eagle. In 2010, Alicia began performing her songs (and modeling clothing with her drawings on them) at some of the Little Eagle fashion exhibitions in Japan. In autumn and winter 2009-2010, Alicia created drawings for Banana Yoshimoto’s novel Another World, a set of drawings for the promotional pamphlet for Lee Jeans Japan’s organic cotton women’s jeans line in collaboration with Pre Organic Cotton, a new set of drawings for Aya Noguchi’s summer 2010 fashion line, illustrations for pop singer/poet Yuki‘s 2010 tour merchandise, and illustrations for the Artist Power Bank Rock Festival merchandise (for the second year in a row). In May 2010, Phoenix Body Mind and Soul presented its first annual Living on the Earth Celebration, featuring Alicia’s live performance, books and recordings. All four of Alicia’s music CDs were re-released by Tokyo-based distributor, Real Music, on July 20, 2010. Alicia performed 12 concerts in Japan between September 21 and November 9, 2010 in support of the re-release of the CDs, including one at a gallery show of her drawings at Cafe Unizon in Ginowan, Okinawa, and three at Gallery Le Deco, in the Shibuya fashion district of Tokyo, at an exhibition of fashion designer Kaorico Ago’s new clothing lines, including a line of clothes printed with illustrations from Living on the Earth. Her 5′ x 8′ patchwork wall-hanging, made between 1967 and 1974, was chosen by the curator of the San Jose Museum of Quilts and Textiles for a special exhibition at the historic Mills Building in San Francisco from October 15, 2010 to January 15, 2011. In 2011, Alicia created illustrations for two pairs of shoes made by Birkenstock Japan (Tatami Shoes), as well as her third consecutive year of festival towel and t-shirt illustrations for the Artist Power Bank Music Festival. She also donated illustrations to print on items sold to raise money for the victims of the March 11, 2011 earthquake/tsunami/nuclear disaster. Alicia toured again in Japan May through July 2012. The tour included a series of concerts at fashion exhibitions for Little Eagle, a fashion company specializing in natural fiber clothes, handmade at a Fair Trade factory in India. Little Eagle licenses illustrations from Alicia’s book, Living on the Earth, to print on some of the clothes. Alicia also lead two art workshops. She created two more pairs of illustrated shoes for Birkenstock Japan, her fourth set of illustrated festival towel and t-shirt designs for Artist Power Bank, her first set of illustrated merchandise for Urban Research/Doors, a chain of stores offering eco-minded products in Japan, and her first set of illustrated packaging for Rainbow Caravan Organic Bakery. From 2012 to 2014, Alicia created created a series of illustrated articles for Murmur Magazine, a fashion and lifestyle journal for environmentalist women in Japan. Aya Noguchi created a new fashion line illustrated with drawings from Being of the Sun. In 2012, Living on the Earth was chosen as one of the 101 most influential American cookbooks of the 20th century by a panel of food experts chosen by the Fales Library at New York University, which contains the largest collection on books about food in the USA. 101 Classic Cookbooks, 501 Classic Recipes, containing both illustrated pages and recipes from Living on the Earth, was published in the same year by Rizzoli/Random House. Alicia’s 2013 Japan tour ran from early June through early August, and included 25 musical performances, 16 of them at Little Eagle fashion exhibitions, plus a gallery show of framed original drawings from Living on the Earth at Gallery Speak For in Daikanyama, Tokyo, and two art in nature workshops. 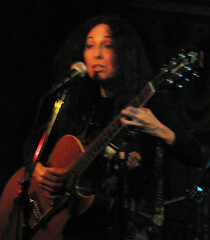 In 2013, Alicia simultaneously released two CDs (her 5th and 6th), Songs from Being of the Sun: 1973 Archival Recordings of Ramón Sender Barayón and Alicia Bay Laurel Performing Songs and Chants from their DIY Spirituality and Music Book, and Living with Young Eyes: My First 25 Years as a Series of Solo Guitar Medleys, an entirely instrumental album of songs Alicia learned and loved between the ages of six and twenty-five. In June 2014, Alicia released her 7th CD, More Songs From Living on the Earth. She continued to write and illustrate articles for Murmur Magazine, a Japanese quarterly journal appealing to women with an environmentalist perspective, and continued to do illustration projects and license existing illustrations to eco-minded businesses in Japan, including organic towels for Urban Research/Doors, and packaging for raw organic chocolates by Cacao Magic. 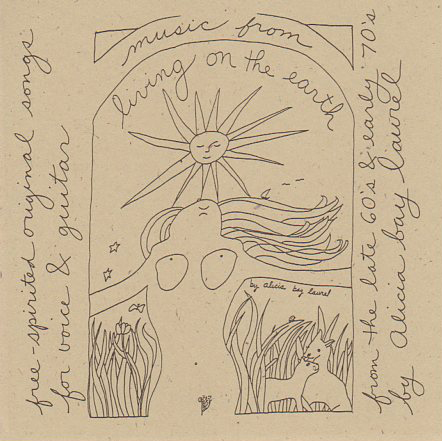 EM Records re-released Alicia’s first CD, Music From Living on the Earth, as a vinyl long play record in 2015. Alicia also illustrated the book Welcome to the World by Yuko Hirose (Mille Books). Keibo Oiwa, a cultural anthropologist, bestselling author, environmental activist and public speaker who teaches at Meiji Gakuin University in Yokohama, licenced Alicia Bay Laurel’s song “Sometimes It Takes a Long Time” for the soundtrack of his documentary film, Embracing the Seed of Life, about the life and work of Indian scholar, environmental activist and anti-globalization author Vandana Shiva. From May 27 to August 11, 2015, Alicia toured in Japan, doing 23 concerts (15 of them in collaboration with Little Eagle), 2 book events and 3 art workshops, and having shows of her framed artwork. At one concert she performed a song with Ikue Asazaki, a great traditional Japanese singer from Amami Oshima. Alicia’s song Ukulele Hula was choreographed by kumu hula Miho Ogura of Moa’e Kala Hula Studio, and was presented by Miho and her halau hula at two events. At the final event of the tour, Alicia was the featured performer at a peace ceremony and concert organized by the Little Eagle fashion company at at historic Nagaregawa Church, at ground zero in Hiroshima, on August 8th, one of the two days between the 70th memorials of the atomic bombings of Hiroshima and Nagasaki. Alicia performing at the peace concert in Hiroshima, August 8, 2015. Click here to see a video of Alicia performing at the peace concert in Hiroshima with vocalist/multi-instrumentalist Takuji. In 2015, Aya Noguchi’s Salon de Balcony spring/summer fashion line printed with Alicia’s illustrations from Being of the Sun was featured in Japan Vogue online. In 2016, Alicia’s illustrated cover of her book, Living on the Earth, was included in the catalog for a show at the Victoria and Albert Museum in London titled You Say You Want A Revolution: Records and Rebels 1966-1970. Alicia also created illustrations for Orie Ishii’s cookbook Rainbow Sweets, and for the packaging of Buddha Sandals, a neutral-heeled earthing sandal. Also, illustrations from Living on the Earth were licensed for two new books: Whole Earth Field Guide by Caroline Maniaque, and Sustainable Fashion: What’s Next? by Janet Hethorn and Connie Ulasewicz. Alicia did her ninth concert tour in Japan in September and October 2016, including a peace concert at the Okinawa Peace Hall. She created a logo drawing for the 25th anniversary of fair trade, sustainably made clothing and craft importer People Tree. Two of her paintings were licensed to appear with an interview with her in Beach Life Magazine (Tokyo). She also performed her original one-woman comedy storytelling and original music performance “Living on the Earth: The Musical” at Beyond Baroque Literary Arts Center in Venice, California, at the Arlene Francis Center for Spirit, Art and Politics in Santa Rosa, California (featuring two duets with Ramon Sender Barayon), and as a house concert in Sedona, Arizona (featuring duets with guitarist Mark Hewins). May, 2016, saw the publication of Lost on Hope Island, by Patricia Harman, the first novel in which the book Living on the Earth played a part in the plot. Alicia’s tenth Japan concert tour, which included 14 concerts (plus singing at the wedding of filmmakers Patrick Lydon and Suhee Kang, in Seoul, Korea) occured in September and October of 2017. In April 2017, Alicia signed a contract with Kachina Ediciones for the publication of Juan Antonio Martinez Sarrion’s handlettered Spanish translation of Living on the Earth (Viviendo en la Tierra), which was released at the end of October 2017. She performed a concert at a book release party at Libreria Nemo, Juan Antonio Martinez Sarrion’s bookstore in Albacete, Spain, on November 25, 2017. In January 2017, filmmaker SJ Chiro licensed Alicia’s song Goodbye 1974 to play under the credits at the end of her film Lane 1974. Alicia’s drawings continue to be licensed to print on clothing designed by Kaoriko Ago Wada for her organic fiber, fair-trade fashion company, Little Eagle. Alicia co-designed a set of t-shirts illustrated with pages from Being of the Sun for the DHC clothing company (Tokyo), and created a set of illustrations for oracle cards, labels and logo for Cremoir Floral Essence’s healing salon in Shibuya, Tokyo, as well as the logo, stationery, signage, and advertising for Good Earth Sandals, of Hilo, Hawaii. Alicia performing at the Tenderete Graphic Arts Festival in Valencia, España, June 8, 2018. In 2018, Alicia again illustrated merchandise for the Artist Power Bank rock festival in Japan. She performed two concerts in Spain to help promote the Spanish translation of Living on the Earth (Viviendo en la Tierra), including at the Tenderete Graphic Arts festival in Valencia on June 8, and at La Feria Ecologica de Albacete on June 9th. 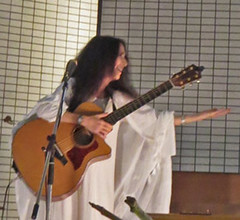 Her eleventh concert tour in Japan (August and September 2018), included “Alicia Bay Laurel: Dancing With Nature,” a one-woman, multi-decade art exhibition at the Sison Gallery in Daikanyama, Shibuya, Tokyo, from September 1 through 20, 2018, which opened with a performance that was filmed for television documentary about Alicia, produced by Setsuko Miura, whose series, Midori no Kotonoha, specializes in programs about nature and environmental activism, on Asahi Broadcasting Station. Alicia released her eighth album, “Alicia Bay Laurel: Live in Japan,” in collaboration with audio engineer Yasushi Yamaguchi, and, also, “The Dancing Lady Coloring Book;” both were debuted during her 2018 Japan tour. October 29, 2018 was the release of Spanish filmmaker Luis Olano’s documentary film about Ramón Sender Barayón, “Trip into the Light (Un Viaje a la Luz),” which includes two of Alicia’s original songs in the soundtrack, illustrations from her books, and footage of Alicia and Ramón performing his sacred chant, “Only Thou.” Also, she and Ramón are collaborating with Juan Antonio Martínez Sarrión of Kachina Ediciones on the upcoming 2019 Spanish translation of their book, Being of the Sun (Ser del Sol), which is expected to be released in September 2019. Alicia’s twelfth Japan concert tour is planned for late August, September and October, 2019.